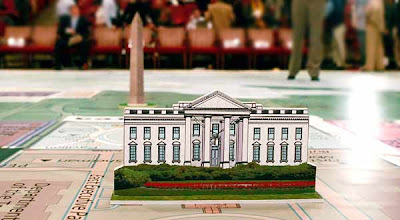 Building Collector: Inauguration Planning for Washington, D.C.
Inauguration Planning for Washington, D.C. The eyes of the world are beginning to focus on Washington D.C. this month. When Barack Obama is sworn in as the President of the United States on the steps of the U.S. Capital on January 20th, everyone will want to witness this historic event. Today, I’ll begin a multi-part series on souvenirs of the Capital, White House and other places of interest to souvenir building collectors. This scale model of downtown Washington D.C. including a miniature White House and Washington monument sits on a 40x40 foot planning map that is spread out on the floor of the D.C. Armory. 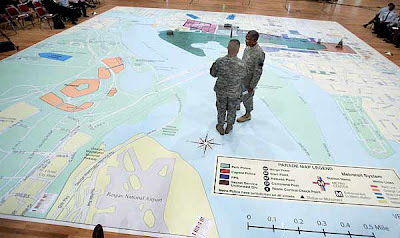 The large map is being used to help plan Inaugural logistics for the January 20th Inauguration of President elect Barack Obama. The city is expecting one of the largest crowds ever for a presidential inauguration.